Home / Property / What Is The Difference Between Renovation & Remodeling? What Is The Difference Between Renovation & Remodeling? When it comes to a construction project, there are several terms in use. It is essential to use the right term in order to communicate the same across and avoid any confusion. The common terms used are redesigning, renovation, preservation, remodeling, rehabilitation, and etc. Those opting for cheap kitchen renovations in Melbourne need to have a clear plan from the start. The basic definition of renovation is "Restore to a good state of repair". Consider a poorly maintained house that is in desperate need of repairs. In this context, renovating the house would mean to restore the house to its original self and fix all old and broken items. To some extent it one would consider the building requires maintenance. The renovation may be drastically obvious or it may be so subtle that it is not noticeable. It is all about restoring and repairing and thus includes either fixing or replacing the old or broken items. Activities like repainting, re-facing, installing new fixtures or removing old ones, etc. fall under renovation of the house. It is also to do with raising the standard of the design, with minor alterations. The aim is to make it more attractive and to update as well as upgrade existing structures. All the cosmetic home improvements fall under this category. Any construction and basic repair that is done without the help of blueprints or plans of any kind will usually be renovations. A good example of renovating is if a bathroom is in desperate need of repair with rusted pipes and cracked bathtub and you wish to restore all things broken and beautify it. To remodel is "to change the structure or form of something". Thus, if you wish to entirely transform your existing kitchen with a new design, it is remodeling and the end result would be a complete change of appearance. Remodeling is not about repairing or fixing a structure. Remodeling is about transforming the physical structure or appearance of a building or room. It involves changing the use of space, changing the layout, or changing a floor plan. Adding or changing the functionality of a room is also often termed as remodeling. For example, remodeling the kitchen to include a living room as well will require a complete change of layout. There is a thin fine line between renovating and remodeling. Hence if while renovating you start removing walls, changing the ceiling height, or adding walls, you have crossed into remodelling. Remodeling is when it is necessary to take a look at the blueprints of the place in order to change the basic structure. For example, to reposition the staircase. The cost of remodeling tends to be more since it is about changing a structure with a different design. The reason being that it is likely to require the full support of construction workers, electricians, plumbers, etc. A good example of remodeling is if you have started to dislike the design of your bathroom, need to add functionality, remove a wall or two and rearrange the shower area to add a tub. 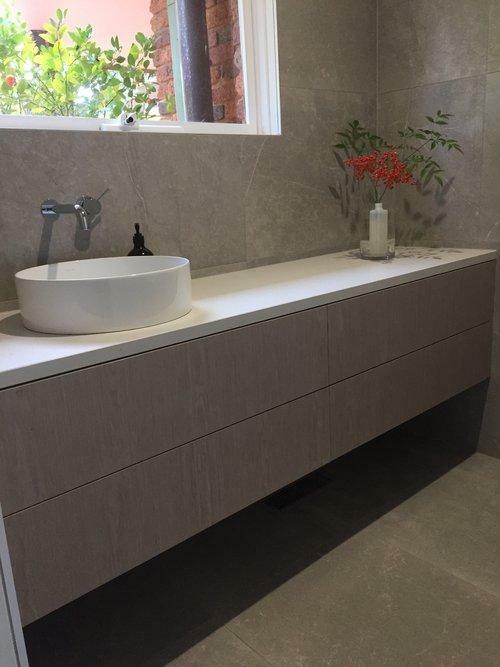 Thus, whether you require cheap kitchen renovations in Melbourne or bathroom renovations in Brighton, it is necessary to decide whether your kitchen or bathroom requires renovation or remodelling. This depends on many factors like budget and changes to be made if your need is to repair or to completely change an existing design.